HP 771 DesignJet Printhead delivers the high quality that's expected and meets fast turnaround times. HP DesignJet printheads help you respond quickly by providing quality, speed and easy, hassle-free printing. 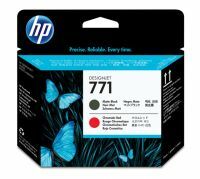 CE018A HP 771 DesignJet Printhead delivers the high quality that's expected and meets fast turnaround times. HP DesignJet printheads help you respond quickly by providing quality, speed and easy, hassle-free printing. Print a wide range of applications from line drawings to photo-quality POP displays. Achieve photo image quality at fast print speeds and impress customers with your responsiveness. Keep your printing running smoothly with HP DesignJet printheads. Avoid downtime and interruptions with HP printheads designed for reliable, hassle-free operation. Receive alerts when printheads need to be replaced. Save time - replacing a printhead is quick and easy. Built in intelligent technology maximises printhead usage life, so you experience fewer interruptions. 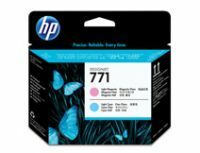 To Recieve updates and possible rewards for Hewlett Packard (HP) HP 771 Magenta-Yellow Designjet Printhead please sign in. To Recieve updates and possible rewards for Printer Cartridge, Ink & Toner please sign in.